For the musicians, see Sirenia (band). Sirenia is an order of fully aquatic, herbivorous mammals that inhabit rivers, estuaries, coastal marine waters, swamps, and marine wetlands. There are four existing species, dugong and manatees, in two families and genera. Sirenia also includes Steller's sea cow, extinct since the eighteenth century, and a number of fossil taxa. The order evolved during the Eocene epoch, more than 50 million years ago. Sirenia, informally sirenians, are referred to by the common name sirens, deriving from the sirens of Greek mythology. Sirenians including manatees and the dugong, have major aquatic adaptations: forelimbs have modified into arms used for steering, the tail has modified into a paddle used for propulsion, and the hind limbs (legs) are but two small remnant bones floating deep in the muscle. They appear fat, but are fusiform, hydrodynamic, and highly muscular. Their skulls are highly modified for taking breaths of air at the water's surface and dentition is greatly reduced. The skeletal bones of both the manatee and dugong are very dense which helps to neutralize the buoyancy of their blubber. The manatee appears to have an almost unlimited ability to produce new teeth as the anterior teeth wear down. They have only two teats, located under their forelimbs, similar to elephants. The elephants are thought as the closest living relative of the sirenians. The lungs of sirenians are unlobed and flattened . In sirenians, the lungs and diaphragm extend the entire length of the vertebral column. These adaptations help sirenians control their buoyancy and maintain their horizontal position in the water . Living sirenians grow between 2.5-4 meters long and can weigh up to 1500 kg. Hydrodamalis gigas, Steller's sea cow, could reach lengths of 8 meters. 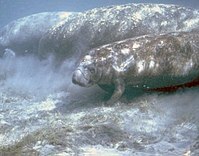 The three manatee species (family Trichechidae) and the dugong (family Dugongidae) are endangered species. All four living species are vulnerable to extinction from habitat loss and other negative impacts related to human population growth and coastal development. Steller's Sea Cow, extinct since 1786, has been hunted into extinction by humans. Manatees and the Dugong are the only marine mammals classified as herbivores. Unlike the other marine mammals (dolphins, whales, seals, sea lions, sea otters, and walruses), sirenians eat primarily sea-grasses and other aquatic vegetation and have an extremely low metabolism and poor tolerance for especially cold water. Sirenians have been observed eating dead animals (sea gulls), but their diet is made up primarily of vegetation. Like dolphins and whales, manatees and the Dugong are totally aquatic mammals that never leave the water — not even to give birth. These animals have been observed eating grass clippings from homes adjacent to water ways, but in this rare occurrence, only the top portion of the sirenia is lifted out of the water. The combination of these factors means that sirenians are restricted to warm shallow coastal waters, estuaries, and rivers, with healthy ecosystems that support large amounts of seagrass and/or other vegetation. The Trichechidae species differ from Dugongidae in the shape of the skull and the shape of the tail. Sirenia has been placed in the clade Paenungulata, within Afrotheria, grouping it with two other orders of living mammals: Proboscidea, the elephant families, and Hyracoidea, the hyraxes, and two extinct orders, Embrithopoda and Desmostylia.